Welcome to the USB-UIRT home page! Here you'll find information about the USB-UIRT as well as links to support files, downloads, as well as a USB-UIRT discussion forum. The USB-UIRT is a USB version of the now-notorious UIRT (stands for Universal Infrared Receiver Transmitter). The USB version offers a simple plug-and-play solution without having to deal with some of the hassles of the classic serial-port (RS-232) version. WHAT DOES THE USB-UIRT DO? - Use codes available from the Web for other remotes (such as the Philips Pronto) to control all of your equipment with Remote (IR) receivers (including special 'discrete' remote codes your brand-name remote doesn't include!). For example, the USB-UIRT could transmit the discrete 'Input 3' code to your TV to directly switch it to input 3, rather than cycling through all of the inputs. HOW DOES THE USB-UIRT WORK? 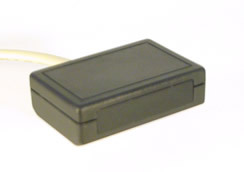 The USB-UIRT contains a small micro-controller which is capable of 'listening' for Infrared codes which are transmitted from most remote controls. When IR signals are detected, the USB-UIRT interprets these signals, decodes them, and sends them to your PC via a USB connection. Automation Software such as EventGhost or Girder can be programmed to respond to these codes. In addition, software on the PC can send IR codes to the USB-UIRT to be transmitted. The USB-UIRT's microcontroller will translate these codes to an Infrared stream and transmit them using built-in IR emitters or a connected IR extension. USB-UIRT is now available for order! Announcing the introduction of the USB-UIRT -- a fully-assembled, plug-n-play version of the popular UIRT. You can now place orders for the USB-UIRT by clicking here.